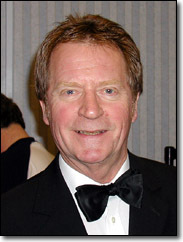 Vic Pitt retired from the Big Chris Barber Band in January of 2007, after serving as the band's bass player for almost thirty years. Vic joined the Chris Barber Jazz and Blues Band in July of1977. He was most often heard on the double bass, although whenever the Chris Barber marching band performed he would pick up the tuba. He also played electric bass occasionally when he first joined the band (his predecessor Jackie Flavelle nearly always played electric bass). What follows is a slightly revised version of Vic's web page constructed when he was still with the band. Vic and his guitarist brother Tony moved to Chatham when their father Jim took over a pub called "The Good Intent": the patrons were musicians and sailors. Jim played banjo and the two brothers grew up with music as an integral part of their daily lives. Vic first played mandolin in a family group, then with Tony joined a local jazz band, the Crescent City Stompers, playing banjo. After that he switched to double bass and joined the Deep Bayou Jazz Band in 1956. Next, Vic joined his brother's skiffle group, playing in Greek Street. The third member was Graham Cottingham on washboard. While playing in London, Vic would often go to the Two I's Coffee Bar, and sat in with many musicians who would become well known in the future. In 1958 he joined Russell Quaye's City Ramblers, again on bass. This skiffle group (see the first photograph in the photo gallery, below) consisted of Russell Quaye (quattro/kazoo/vocals), Hilda Sims (guitar/vocals), Jim Macgregor (guitar/vocals), Shirley Bland (washboard), Eric Bunyan (fiddle/mandolin), Bob Taylor (blue-blowing/jug/snare drum), and Vic Pitt (bass). They recorded four tracks while Vic was in the band, for the Tempo label, an EP (EXA 77) featuring "Delia's Gone", "Keep Your Pistol Good and Loaded", "Careless Love", and "Boodle-Am-Shake". A single was taken from the EP, with "Delia's Gone" and "Boodle-Am-Shake" (A 165). While playing skiffle Vic was also gigging with many bands, and depping for players such as Jim Bray and Jack Fallon. When Kenny Ball's then bass player Brian Prudence left, it was Jack who suggested to Kenny that Vic take his place. This was in 1959, and for the next eighteen years Vic stayed with Kenny. In 1960, brother Tony was also briefly in Kenny Ball's Jazzmen. In 1961, while appearing with the Ball Band in the film It's Trad Dad, Vic also stood in for Terry Lightfoot's bass player (Vic Barton). To disguise himself he wore sunglasses! In 1977 Vic started his second long engagement, this time with the Chris Barber Band. While with Chris, Vic has accompanied many visiting musicians, his two favourites being John Lewis (the "Swing Is Here" Tour in 1978; a live recording was made in Holland and is available on Black Lion BLCD 760517) and Doctor John (in the early 1980s). John Lewis was most impressed with both Vic and Pete York as a rhythm section. The band recorded on more than one occasion with Doctor John. The first occasion produced a concept album (Take Me Back To New Orleans; Black Lion BLCD 760163) recorded in April 1983 at the second of two sell-out nights at the Marquee. Vic also took part in the Get Yourself To Jackson Square album, reissued on Timeless CD TTD 612. During his time with the band Vic also recorded with the "Top 8" (including Acker Bilk, Rod Mason, Keith Nichols, and other European Jazzmen) and Wally Fawkes, partnered after twenty-two years with brother Tony. (This collaboration has been reissued on Lake LACD 207). Vic also played on all three of John Crocker's fine albums (all on Timeless Records). On a personal note, I came to know Vic as a friend while he was with the band, and I appreciate his co-operation in writing this short biography – Julian Purser. Copyright © Julian Purser 2004. Copyright publishing licensed to chrisbarber.net. Music: The obvious choice of music to represent Vic's work is Big Noise From Winnetka , his bass-&-drums duet with Colin Miller on the CD Cornbread, Peas And Black Molasses. Almost every other Barber recording since 1977 features fine bass work by Vic; as an example we have chosen New Orleans from one of the Doctor John sessions. Sources: Gerard Bielderman's Kenny Ball Discography; Skiffle, by Brian Bird (published by Robert Hale, 1958); Skiffle, by Chas McDevitt (published by Robson Books, 1997).